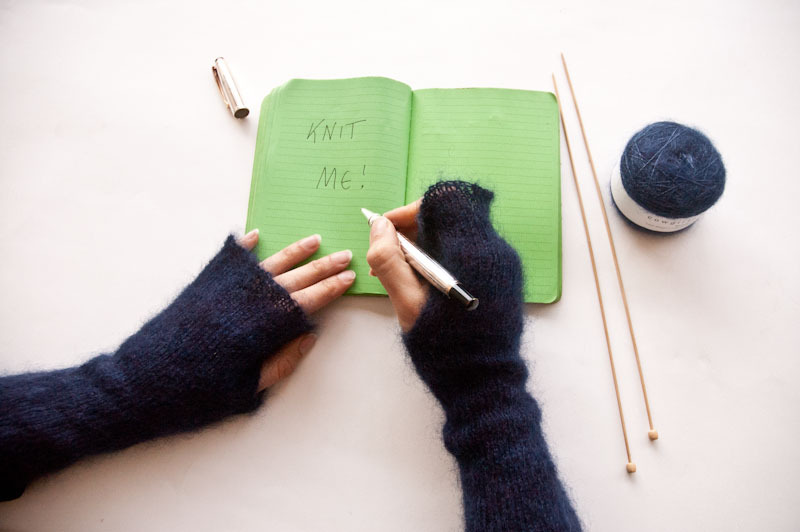 Mittens are a great accessory to have on hand (pun intended!) and I’m a big fan of the fingerless mitten variety. I particularly love this very light and soft pair knitted in our Cowgirlblues Kidsilk yarn. 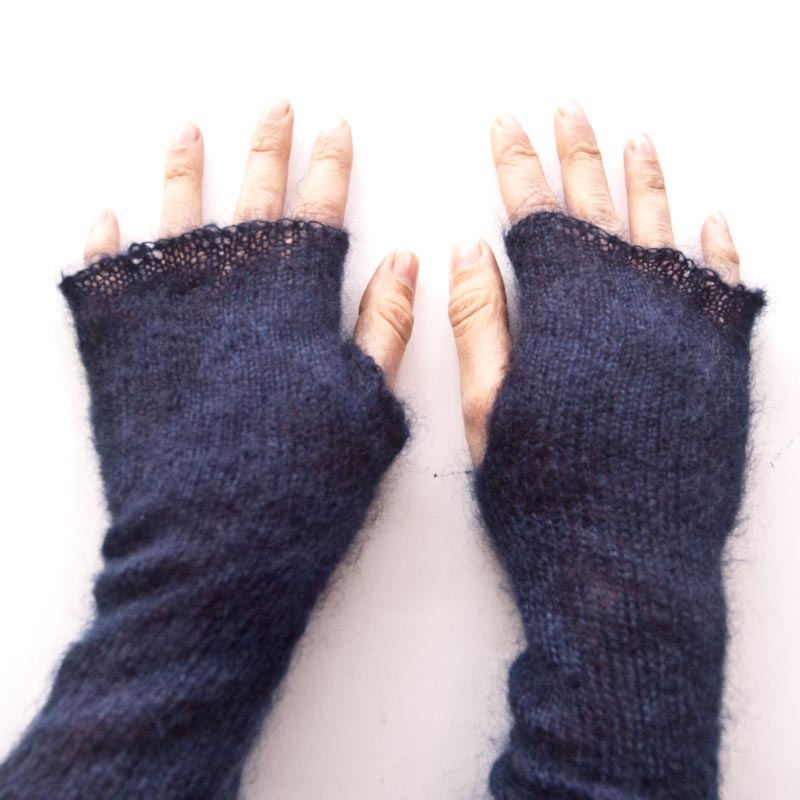 They are a relatively easy knit for an intermediate knitter, with a small challenge in the thumb “sleeve” if that’s your flavour. 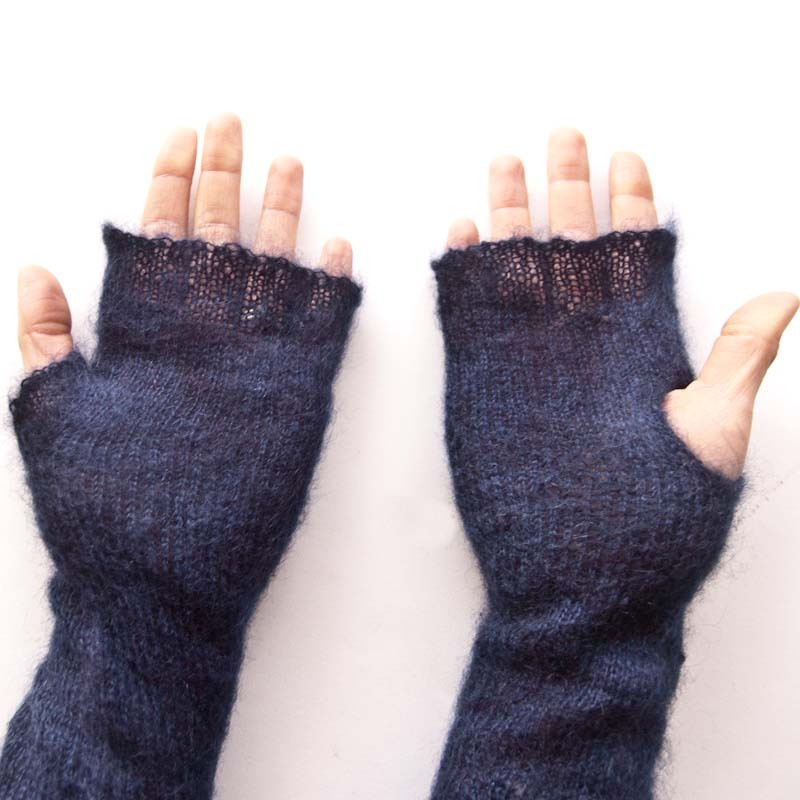 These fingerless mittens are also a nice intro to double pointed needle (dpns) circular knitting for an advanced beginner. Check your gauge and mitten size before starting so that you get a good fit. Join to form a circle, taking care not to twist the stitches. Work 2 rounds on 3mm needles then change to 2.25mm needles and continue to knit in stocking stitch (all knit when you’re working in the round) until your work measures 16cm. Turn your work to the purl side, and instead of continuing in the round work a purl row back on the “wrong” side. You’re leaving open the beginnings of the thumb hole and will continue working back and forth to form the sides of it. At the end of the purl row turn your work again to the knit side and work a knit row. Continue in this fashion for 12 more rows ending on a knit row. Knit another 4cm in the round then change to 3mm dpns. Work one more round then cast off loosely and finish away your ends. Repeat the pattern for the second mitten. When you get to the end you can decide how you like the thumbs, and what your appetite is for working with a very small circle. If you opt out of thumb sleeves, as in the right hand pictured here then you’re done. Start at the base of the thumb using 2.25mm dpns and pick up 28 stitches around the edge of the thumb hole. Join these to form a circle and knit 2-4 rounds (depending on your fit preference). Change to 3mm dpns and cast off loosely.